John Shapland Yeo was born in 1860 at Stonehouse, Gloucestershire. His parents were John Yeo and Emma Matilda Spearing and grandparents, James Yeo & Elizabeth Shapland. His parents had moved to Gloucester in the early 1850's and had a grocery and drapery business. John Shapland Yeo was obviously a very intelligent boy, who had a mathematical talent. He was educated at Blundels School in Tiverton, Devon and then was awarded a scholarship to St John's College, Cambridge. Whilst at Cambridge University he was ranked as the second wrangler in the Cambridge Tripos. The Graphic , Cambridge University - Feb 18, 1882........Mr. John Shapland Yeo, Scholar of St. John's, the Second Wrangler, is a son of the late John Yeo, of Stonehouse, Gloucesterhire, and was born in 1860. He received his primary education at Blundel;s School, Tiverton, under Mr. A.L. Francis, the Rev R. Duckworth being the mathematical master. In 1878 he was awarded an open Minor Scholarship at St. John's College of the value of 7-/- per year, and in the same year was elected to the Huish Exhibition of 5 0/- p er year open to scholars from Sherborn, Taunton, Exeter and Tiverton schools. In 1880 he was elected a Foundation Scholar of St. John;s. At the college examinations in each year of his residence, he was obtained the first place. He was awarded the Hughes Prize , Sir John Herschel;s Prize for Astronomy, and the Wright Prize. His college tutor was Mr . J.E. Sandys; his private tutor, Mr. R.R. Webb. M.A. Fellow of St. John's. When he left Cambridge University he went to Edinburgh, Scotland and became a teacher at Fettes College, a very large public school. I had this old copy of the Fettesian dated March 1905, sent to me by Jill Yeo of Dubbo. It was found amongst the family papers and it was the great affection all of his pupils had for John that made me want to include this on the website and share it with others. His pupils write of him being a hero with an understanding heart, brave, honest and kind. What better tribute could anyone have. 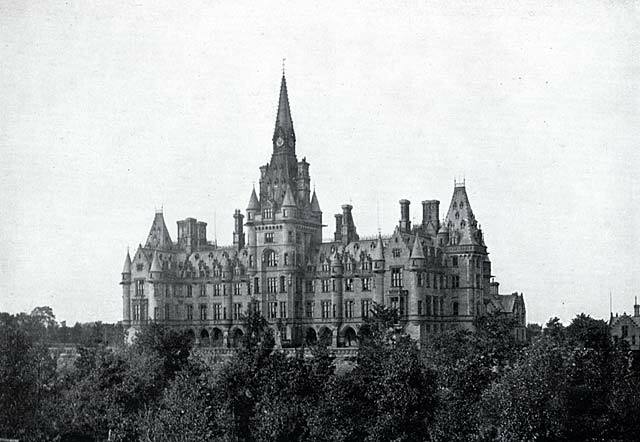 John died on the 24th November 1904 and was then living at Carrington House, Fettes College, Edinburgh, his admin was granted to his brother, George Christopher Yeo, a manufacturer. He was only 44 years of age. Fettes College is situated in large grounds to the north of Comely Bank and to the west of Inverleith Park in Edinburgh. This is the school that the British Prime Minister, Tony Blair, attended. This Circular was addressed to all Old Fettesians. A General Committe and an Executive Committee were appointed at that meeting, and the latter Committee was directed to take all necessary steps for collecting subscriptions, and to report to a future meeting to be haled at or avout the time of the Sports in April. At that meeting a discussion took place as to the form that the Memorial should take,and in the course of the discussion the following was suggested, viz:- (1) A new Pavilion for the Field; (2) A Mathematical or Science Scholarship; (3) A Boys' Club in one of the poorer districts of Edinburgh; (4) A Window in Chapel; (5) A Fund for School prizes. Whilst these forms of Memorial have been proposed the Committee invite and will gladly consider suggestions as to other forms which the Memorial might take. It is hoped that the sum subscribed will be at the least £1,000. If you are willing to subscribe, please forward your subscription as soon as possible to the Hon Treasurer, Frank Hunter, Esq., W.S., 7, York Place, Edinburgh. Here in America news come to us tardily from Scotland, and it is only quite recently that I received the Fettisan in which are recorded the deaths of two kindly friends of my far-off Fettes days: I allude to the late Miss Brook, and the late John S Yeo. I remember Mr Yeo best at a time when he had not yet attained to the Housemastership of Carrington, but was a popular and much-loved housemaster in the School House. To all the small boys whose Mecca was the reading room fire, and whose playground was the top passage, he was a hero, and an understanding heart. So long as the revelry 'after prep' was within respectable bounds, Mr Yeo would not interfere, and as he strode through the sky-larking merry crowd he had a kindly salutation for one and all, and a hearty laugh at any particular humerous incident of the moment; maybe a gentle but firm protest as a couple of shining threequarters of First Below crashed neck and neck into the glass doors at the end of the cirridor. And now brave, honest, kindly John Yeo has passed for the last time through the playing ranks of Fettes and has gone, with his splendid faith in clean healthy boyhood, through the doors at the End of the Passage. Over the long years, over the broad Atlantic, as we sit hand in hand with Memory, comes the wish that we had better followed the fine manly examples of a man like John Yeo, that we had better responded to the beautiful mature-love in the heart of a woman like Miss Brook. There were lessons we might better have prepared for the one, for the other there were flowers we might often have gathered and given as a token of regard for one who did so many kindly things for us. Ah! Well! 'Tis the End of the Passage. And fit as Galahad to find the Grail. So was it with our friend that now is gone. Then no man could stand up and block his path. Carve in your hearts a memory of this man. Fit to be written on the scroll of time.